As part of the country’s single largest comprehensive data-sharing exercise on traffic patterns to improve urban mobility in the cities of Delhi, Mumbai, Bengaluru and Hyderabad, Uber today launched Movement in Bengaluru, following successful launches in Delhi and Mumbai. One case study, “Examining the impact of Metro on travel times in Bengaluru: Baiyappanahalli- Whitefield extension” uses data to calculate the impact of the eastern expansion of the Purple Metro Line in Bengaluru, comparing peak travel times from Bagmane tech park, Baiyappanahalli to Kadugodi, Whitefield between 1st January 2017 to 31st March 2017, against 1st January to 31st March 2018. The study points to a ~13.5 % increase in the AM peak travel time, and a slightly higher increase of ~16.4% in the PM peak travel time between the two periods, suggesting an increase in congestion on the route. The data observes a significant difference in the peak travel times during the weekdays as compared to the weekend, with weekday AM travel time being ~57% more than the weekend. Interestingly, the study also estimates that the average travel time in the first quarter of 2020 will be upwards of 57 minutes. After a detailed analysis, the tool reveals that post the expansion of the metro line, there will be a ~21% decrease in travel time between the areas near both ends of the metro route, hinting at potential solutions to incentivize multiple last-mile and first-mile connectivity options alongside the metro to smoothen overall travel times. Besides a reduction in travel time, there will also be an expected reduction in stress, noise pollution and carbon emissions in the city, suggests the study. What’s interesting is that the data approximates a reduction in the cost of travel as well through low-cost last and first mile options as compared to that on-road, depending on the cost of fuel at that time. Other data sets from Uber Movement reveal interesting insights on travel time during peak hours. Peak hour traffic in major Indian cities like Delhi, Mumbai, Bengaluru and Kolkata almost doubles the travel time along some popular routes. Similarly, data reveals an adverse impact on travel times during festivals. The study showcased a 30% increase in travel time between Vasant Kunj to Lajpat Nagar during Dhanteras (October 17, 2017) in Delhi and over 20% hike in travel time throughout the capital. 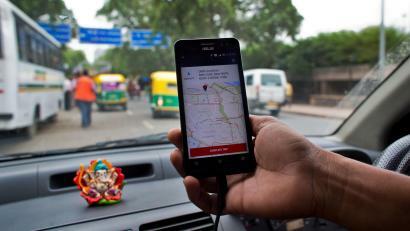 According to an April 2018 study by consulting firm, Boston Consulting Group (BCG) titled, “Unlocking Cities: The impact of ridesharing across India”, traffic congestion during peak hours in four major cities — Delhi, Mumbai, Bengaluru and Kolkata — costs the economy a whopping $22 billion annually. Further, on average, travellers in Delhi, Mumbai, Bengaluru, and Kolkata spend 1.5 hours more on their daily commutes than their counterparts in other Asian cities during peak traffic times. In fact, peak-hour congestion, which implies the additional time taken during peak traffic to travel a given distance, in these four Indian cities is estimated at 149%, much higher than the Asian average of 67%.